Don’t get lost in all the noise. Listen for God’s still, small voice. In the book of 1 Kings we learn of a prophet named Elijah, who did great works by God’s power. He challenged 450 Baal prophets and 400 Asherot prophets (Baal and Asherot are other gods in the land). He had a face off with these prophets, and the challenge was to prove that there was only one God over all. Elijah tested all the man saying, “let’s see if your “god” even responds! My God will answer by fire!” Imagine his conviction, he was one man against a multitude of men. That’s how deep Elijah’s faith and relationship with God was. After all, Elijah knew he served the Most High God and that His God would not abandon him nor would he put him to shame. The other prophets men, prepared their altar and placed a bull on it (as a gift to their god), then called on their god but there was no response. They began to dance around, cut themselves and did this until the evening; except their god never showed up. Then Elijah set up his altar with stones representing the 12 tribes of Israel, and poured water over it all. He then prayed to the Lord, and God consumed the bull and the water by sending fire from heaven! After this defeat Elijah killed the prophets, and Jezebel threatened Elijah saying she would kill him for certain! Yet, for some reason, Elijah believed his life was in danger and ran into the wilderness to hide in a cave. After some time in the cave and putting a hault to his own purpose in God, the Lord pursues Elijah. And also confronted him by His word, asking “what are you doing here Elijah?”. Elijah explained, and the Lord instructed him to stand by the entrance of the cave where He would pass by. Elijah did so: there was a whirlwind, and an earthquake but God was not in the wind; he also saw a fire, but God was not in the fire: then he heard the whisper of God asking Him: “what are you doing here, Elijah?”. God speaks to us in a still voice, His voice does not bring confusion or stress; God’s voice brings inexplicable peace, and order into our lives. When we share with people that God speaks to us, people often become confused; wondering are they hearing things. It is not a loud thunderous voice we hear; it is not a melodic voice we hear, or a taunting, or yelling voice we hear; if you hear this please seek professional help. 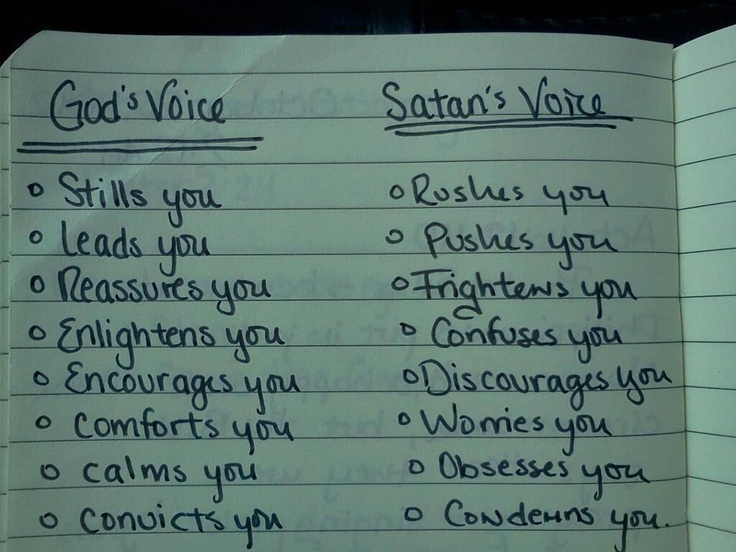 God’s voice is a still voice, a soft and calm directive or question. And to differentiate another way in which God speaks to us is when God prompts us with a word. This is a product of His Holy Spirit. God will lead us, and cause us to give a word to someone or to receive a word and we may not hear the voice of God. He will simply bring a word to remembrance or will place a vision in your mind of what He is to deliver. God speaks through His Word, through our thoughts, through conversations and through circumstances even TV, music and advertisements. We cannot limit God, because He wants to make Himself and His will known. I pray you all received increased discernment to know the voice of God, the voice of Satan and the voice of your soul. Lord Jesus, I am grateful that I serve a living God. A God that can speak to me at anytime and in anyplace. I am blessed to know that you can redirect my life at a moment’s notice. I am eternally grateful for the peace you bring to my heart, by simply speaking to me in your soft and still voice or through your word. You are awesome my God. Blessed be your name, and may you be exalted in the nations of this world. I present my loved ones and those reading today, may you open their eyes of understanding, their spiritual ears and their hearts to see you when you are not in the places where they may expect you to be. May we lean towards your leading, as we are the true sons and daughters if we are led by your spirit. I thank you for making yourself known to all those who desire you, in Jesus name. Amen.